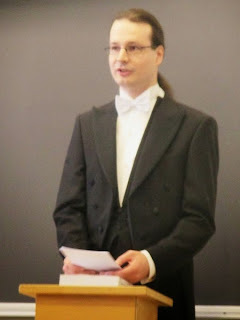 Ville Marttila is defending his thesis "Creating Digital Editions for Corpus Linguistics - The case of Potage Dyvers, a family of six Middle English recipe collections". 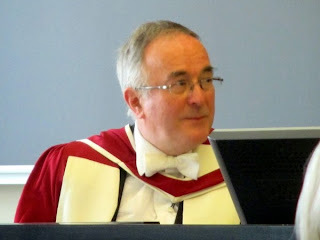 Professor Graham Caie (University of Glasgow) serves as the opponent, and Professor Minna Palander-Collin as the custos. One important contribution of the work is based on the idea of layered annotation. Marttila describes in detail documentary, descriptive and analytical annotation. By using annotation overlays, one can highlight the differing ontological status of the descriptive annotation versus documentary and analytical annotation. The division also can also be useful in defining editorial responsibilities. The whole has been built on existing standard solutions when possible putting these together as a coherent whole. The opponent, professor Caie started his remarks very positively, stating that the thesis is absolutely brilliant and even characterized it the most impressive thesis he has read during his 40 years career. He also mentioned about the VARIENG unit at University of Helsinki as one of the leading centers of historical corpus linguistics. The opponent characterized the work to have content even for two or three theses, being impressive not only in quantity but also in quality.